Many may have had doubts about how Bethesda would succeed in making a VR game. But actually the company has had some experience with VR games and have the technical knowledge to do it. The first of the project was the Skyrim VR, with other games set to be released into VR. If you have played the 2D version of Skyrim then much of the setting of the game won’t seem any different. The Skyrim VR takes place in a province with the same name as the game. Much of the scenery is the similar as the previous game but the experience is worth playing . The start may actually scare the hell out of you with a when a fire breathing dragon burst through the walls. The original game may not have been made for a VR mode but the changes they have made for the game are important to mentioning. The menu for control has been modified to fit the VR setting you can easily access it in front of you . While it is placed quiet well not to distract you from the main game. 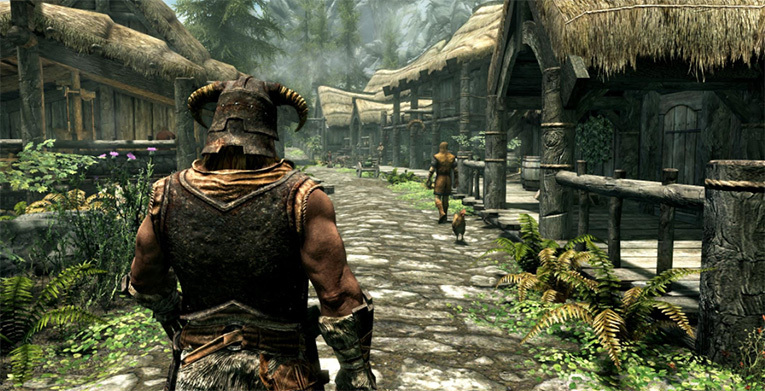 Whether you are a fan of the previous Skyrim game or a VR fan, both of you will be satisfied with what the Skyrim VR has to offer. At first you get to choose your character you want from gender, age or also modify your surroundings. Hence your can make your avatar to your liking. The game starts with you being taken as a prisoner with other criminals. As you are about to be executed a dragon emergence from nowhere to attack the town. The story about the dragons was an experience told to have happened a long time ago but they have come back because you have blood ties to them. The game gives you choices on who you want to be. If you want be a hero or villain the choice is yours. Also the skills you want to have from being a cook or hunter your options are unlimited, with also the fighting skills being different, from using magic to stealth. The controls you want to use is your choice though a game pad may not be the best where you will get almost the same experience you would as on a 2D Skyrim. Joystick helps you move around with buttons that enable your weapons or spells. But if you want to get the best out of the Skyrim VR using the PS motion controls is what you need. With the controllers representing your hands where you have a weapon. For magic your hand will make fire or electricity to destroy your enemies. Going from playing the game to going back to the menu to choose your weapon may be annoying and time wasting. You get to teleport around the world. It may seem hard at first but with time you get used enjoying it even. Movement for your avatar is so limited with no full rotation available. This makes it so hard when your enemies attack you, you are not able to completely move. Aiming at your enemy thus becomes very difficult with missed shots, shielding yourself is also hard hence all this inconveniences make it hard for you to defeat anyone. Playing the game while standing would be the best in helping with the movement. Immersion is the feeling of having a physical presences in the game. With the game previously not made for VR there are times it reduces the experiences of being in the game. Compared to other VR games the Skyrim VR actually gives a wide world to move around with many places to visit. Also the activities you can do around are diverse. The scenery also looks so good with the view of how large our world is and the sky being the best ever. Bethesda is known for making quality games and with its venture into VR games brings more option to the players. The Skyrim VR may not be as quality as expected but as the first VR game for the company to make it is a job well done. So if your used to playing the game in 2D and you want to get the complete VR experience you can order the game online.